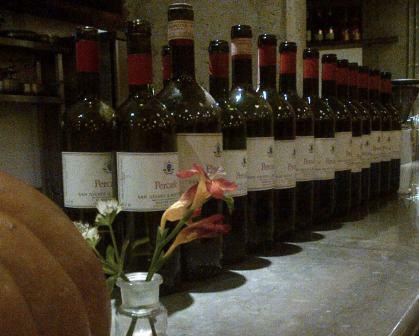 Another great and very interesting evening of Italian wine drinking/tasting last night. The venue was Zucca and Eric was at the helm of the tasting as ever. 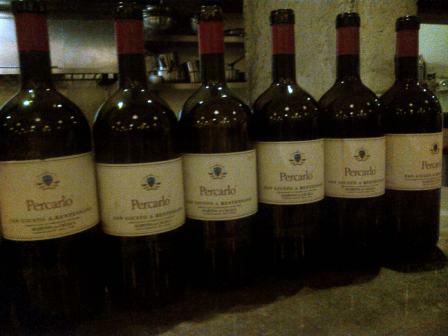 The evening was all about the top wine from San Giusto a Rentannano namely “Percarlo”. The wine was first made back in 1983 but so little was made that the 1985 was the first real vintage that was sold commercially. The wine was named as a tribute to a friend, “Carlo”, of the owners family. It is a tricky wine to pigeon hole in so far as it was outside the Chianti rules at the time it was made, because it is 100% Sangiovese without the then required 15% white grapes, but isn’t now. So in many ways it more truly a “Super” Tuscan than the imported grape variety “Super Tuscans”. No 2000 or 2002 of the wine were made. 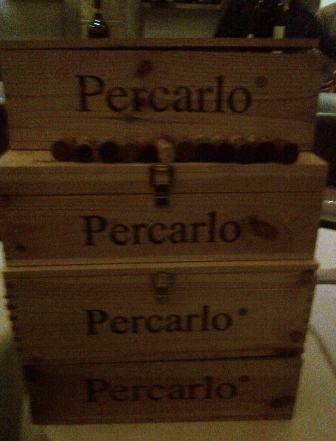 The grapes which go into the making of Percarlo are selected, bunch per bunch, from vineyards whose soil is composed of layers of sand and stones which lie 2 to 5 meters deep and rest on beds of clay. The vineyards are situated at an average altitude of 270 meters above sea level. Fermentation and maceration take place in enamelled cement vats and last up to 35 days. The yeasts produced are natural. Aging is in French oak barriques for 20-22 months before being bottled unfiltered and held in bottle for another 18 months before being released. We started the evening with some Ayala Zero Dosage, a good palate cleaner if a little too “zero” for me, it set things up nicely. All the Percarlo’s were from magnum with the exception of the 1988 and 1993 which were from bottle, there had been a mag of the 1988 but we drank that back in august on the golf, bbq, poker day. All wines had been decanted out of the bottle and back in just before the tasting. We tasted in flights of two or three wines. I have put a (my) definite score by the wines I deem mature or as near to it as matters and a range for those that I expect to show marked change/development. Post tasting it was pasta and pheasant ragu courtesy of Sam, what a great dish it was too…could have eaten it for ages. 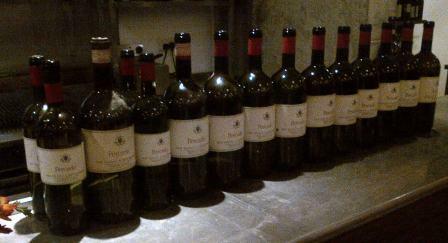 A double magnum of Fontalloro 1997 was a willing accomplice. 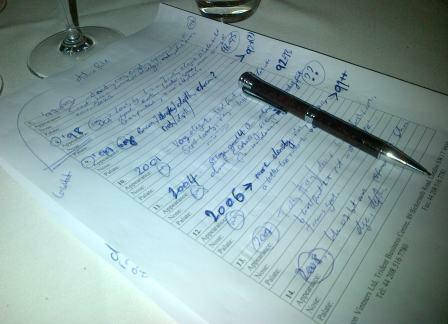 A great tasting…the 8’s just had it for me but a lot of good wines and very few disappointments.